Mothers have been receiving bad press since that mytho log ical 'monstrous mother', Medea, killed her children. The "Cruel Mother" motif has been a recurrent representation in plays, ballads, poem s and novels for centuries and continues to survive in the 'monstrous mother' motif of contemporary media infanticide and child abuse discourses. 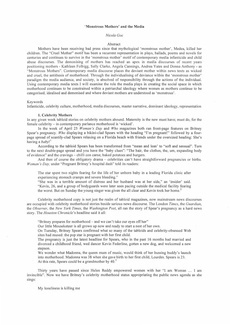 The dem on ising of mothers has reached an apex in media discourses of recent years positioning mothers - Kathleen Folbigg, Sally Clarke, Angela Cannings , Andrea Yates and Donna Anthony - as "Monstrous Mothers". Contemporary media discourse places the deviant mother with in news texts as wicked and cruel, the antithesis of motherhood. Through the individualising of dev iance within the 'monstrous mother' paradigm the media audience, and soc iety, is absolved of responsibility through the act ions of the individual. Using contemporary media texts 1 will examine the role the media plays in creating the social space in which motherhood continues to be constrained within a patriarchal ideology where women as mothers continue to be categorised, idealised and demoni sed and where dev iant mothers are understood as 'monstrous' .